The Lumenis UltraPulse Encore laser resurfacing treatment is a combination of Active FX and Deep FX. These lasers offer fractional CO2 resurfacing and are excellent at treating deeper wrinkles, severe textural issues from sun damage, blotchiness, acne scars and surgical scars as well as pearly penile papules. Not only does the Active/Deep FX decrease the appearance of sunspots and scars, it stimulates the production of collagen, which will lead to gradually improving results as time goes by. Our doctors in San Diego uses the high-energy laser to target the unwanted spots or wrinkles on the face, leaving some areas untouched. By treating just a “fraction” of the skin on the face, the healing process is much quicker. When used together, they offer a full range of fractional resurfacing: Deep FX offers a deeper micro-ablative treatment to target deeper wrinkles and acne scarring, while Active FX offers a large superficial spot treatment targeting sun damage as well as, tone and texture. With Total FX we are able to achieve maximum results in collagen production and skin resurfacing in one single treatment. Not only can it be used alone, but it can be used with the Sciton Erbium laser for a combination laser resurfacing treatment that provides significant improvement for diverse issues like fine lines, pigmentation, sun damage, etc. What Does Active/Deep FX Treat? The Lumenis UltraPulse Encore Active FX has proven to be effective in treating the superficial layers of the skin, often having the greatest impact on reducing the appearance of sun damage, thus giving the skin a more youthful glow. What Are The Benefits Of Active/Deep FX? The introduction of ActiveFX and DeepFX—the first fractional CO2 treatments available—reduced downtime and provided dramatic results. Both procedures require only one system, one pass, and one treatment. 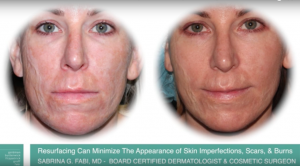 With over 45+ lasers, the doctors at Cosmetic Laser Dermatology in San Diego are experts in resurfacing treatments. The UltraPulse Co2 is a favorite to use because not only is it well-tolerated, but it provides patients with excellent results. The Active/Deep FX resurfacing treatment penetrates deeper, optimizing collagen production while reducing recovery time. We are now able to customize every treatment in San Diego based on each patient’s needs. 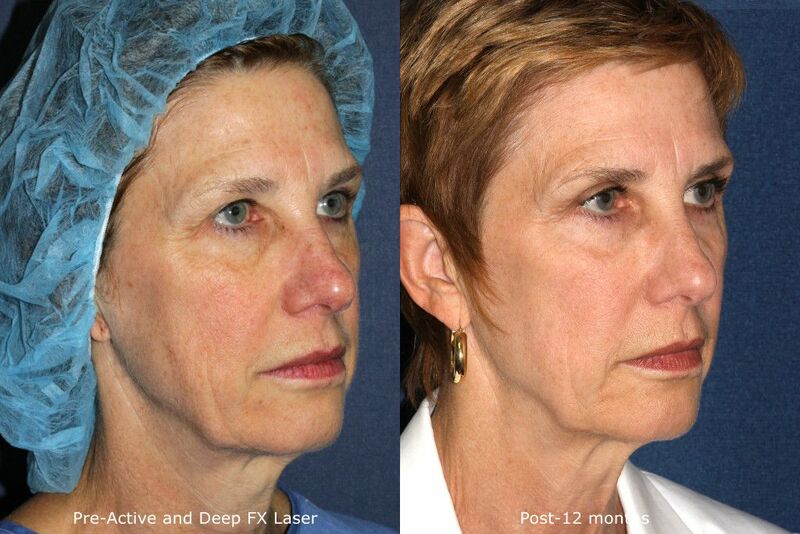 Both Active and Deep FX laser procedures can be performed in one treatment session. The Active FX to treat sun damage and improve the skin’s tone and texture, while with the Deep FX we are able to target deeper wrinkles and scarring. During an Active FX treatment in San Diego, a high-energy beam of laser light is used to resurface the skin by smoothing out lines, wrinkles and/or scars removes brown spots and pigmentation and tightens the skin. The laser treatment also stimulates the production of new collagen, which continues to improve the appearance of your skin over time. 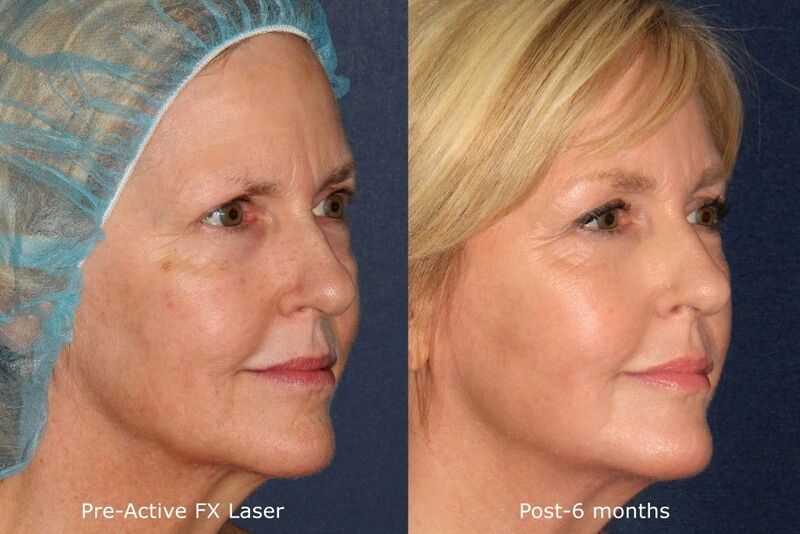 Active/Deep FX laser treatments can last from 30 minutes to an hour. Before the procedure, we will apply a topical anesthetic to the area that is going to be treated to minimize pain. 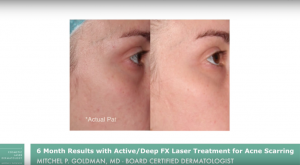 Depending on your ultimate goals, our doctors in San Diego will use either the Active FX laser hand-piece, Deep FX laser hand-piece or both lasers to treat your skin. As the laser is applied you might experience a warm, tingly sensation, which many patients compare to the feeling of a sunburn. The Active FX only treats a fraction of the skin’s surface, leaving small “bridges” of untouched skin, allowing for the skin to heal quicker. 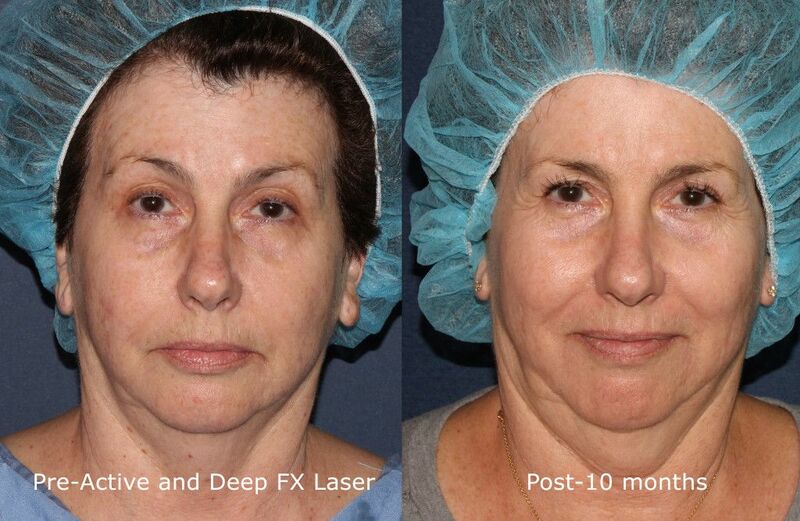 With a Deep FX treatment, the laser penetrates deeper into your skin to improve deep wrinkles and lines. Combining Active and Deep FX treatments for the best possible results is called Total FX. Immediately after the Active/Deep FX laser treatments, your skin will appear red and slightly swollen, but this should go away within a day or two. The recovery time after an Active FX treatment is quicker than the recovery time needed for a Deep FX treatment because the Active FX is a more superficial treatment. Within a week your skin should start looking smoother, but your skin will progressively improve over the next few months before you see the full results. Q: What is Active FX? A: Active FX is a fractional laser procedure. A high-energy beam of laser light is used to smooth out lines, wrinkles, and scars, and to remove brown spots. Active FX treatment stimulates the growth of new underlying collagen, promoting skin improvement over time. Q: What is Deep FX? 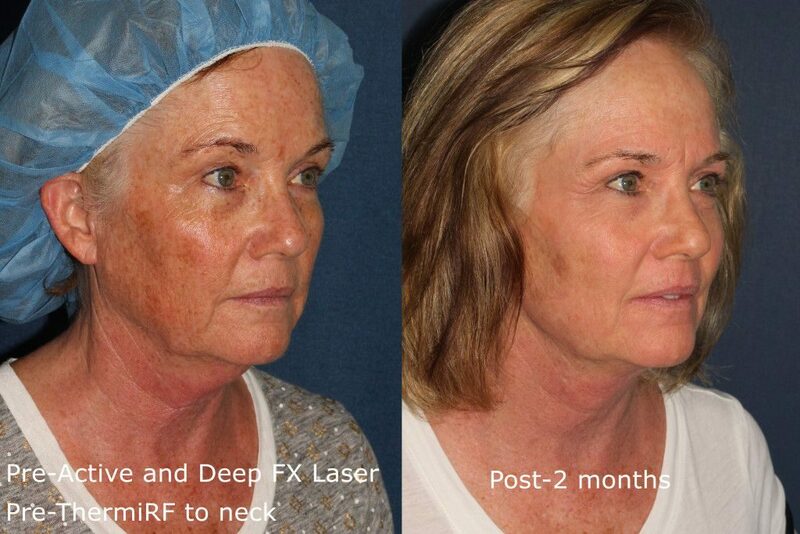 A: Deep FX is a fractional laser procedure used to improve the appearance of aged, sun-damage or scarred skin. The Deep FX laser penetrates deeper into the dermal layers of the skin than the Active FX and is a better treatment for deeper wrinkles. Deep FX stimulates the regeneration of new collagen growth throughout the entire treatment area. Q: What is Total FX? A: Total FX treatments are a combination of both an Active FX and Deep FX treatment. While Active FX treats the more superficial wrinkles and color issues, the Deep FX targets the deeper wrinkles, providing overall skin improvement. Q: How long does an Active/Deep FX procedure take? A: Active/Deep FX treatments are generally quick, lasting around 30-60 minutes. However, you will need to arrive early to the appointment to have a topical anesthetic cream applied to reduce discomfort during the procedure. The length of the procedure depends on how many areas of the face, neck or chest are being treated and if you are doing a Total FX treatment or just one of the laser treatments. [answer-faq][question-faq]Do Active/Deep FX treatments hurt? [/question-faq][answer-faq]Active/Deep FX treatments can be compared to the feeling of a rubber band being snapped on your skin combined with head. To minimize discomfort during the procedure a topical anesthetic is applied prior to the treatment. Some patients experience a tingling sensation similar to that of a sunburn after the treatment, but this normally goes away within a few hours. Q: How many Active/Deep FX treatments will I need? A: Patients generally receive a series of Active/Deep FX laser treatments in order to see the best results. During a consultation our doctors will analyze your skin and recommend a personalized treatment plan, usually 3-5 laser treatments, every 3-8 weeks. The exact treatment plan depends on the needs of the patient and factors such as age, skin type, etc. Q: When will I see the results of the Active/Deep FX? A: Visible results from Active/Deep Fx treatments come in two stages. Immediately after your first laser treatment, there will be noticeable improvements in your skin tone and texture. Your skin will continue to improve over the next few months. Your wrinkles and fine lines will continue to reduce as new collagen growth plumps the skin. Q: How long do the results of Active/Deep FX last? A: The results of the Active/Deep FX laser treatments are long-term but not permanent. With proper sun protection and skincare routine, the longer the results will last. Q: How much downtime should I expect after a Active/Deep FX laser treatment? A: There is minimal downtime after Active/Deep FX laser treatments. Right after the procedure, your skin will be red and slightly swollen, but this fades within 1-3 days. Many patients are able to cover up the redness the next day and return to work or daily activities. Additionally, many patients experience some skin peeling within the first week after the treatment. Using a moisturizer will help reduce the appearance of flaky skin. Q: What are the side effects of Active/Deep FX? A: Like most laser treatment side effects, Active/Deep FX side effects are mild and can include some swelling or redness after the procedure. You will also experience some skin flaking around the treatment area, which you can treat with a gentle cleanser and moisturizer. Q: How much does Active/Deep FX cost? A: The cost of Active/Deep FX laser treatments are unique to each patient. 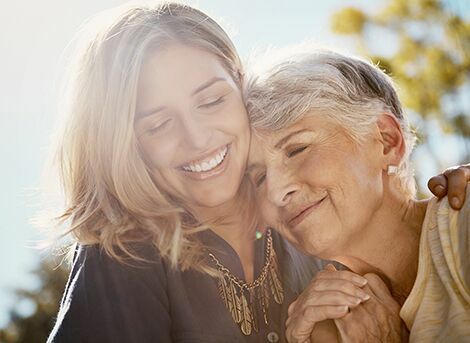 We would be more than happy to give you a personalized Active/Deep FX treatment plan and cost estimate during a consultation with one of our expert laser dermatologists. A: Our doctors do everything they can to ensure the pain associated with any of their laser treatments is minimal. Prior to a Lumenis Active FX treatment, the doctor will apply a topical numbing cream that will set on the skin for up to 60 minutes before the laser is used. This will keep the patient from feeling much of the laser during the treatment. After the procedure, the patient may experience some redness and/or burning that will diminish within a few days and that can be soothed with an ice pack. A: While it does depend on your exact case, most people will want to get 3-5 treatments to see ideal results. Your skin type, skin condition, and other factors will help your doctor determine the right number of treatments for you. Q: How expensive is the Lumenis Active FX procedure? A: The number of treatments and length of treatment will vary from one individual to the next; therefore, we cannot give one flat rate. Cost will be determined after visiting the doctor for a consultation and getting your treatment plan. A: As long as you take care of your skin and protect it from sun exposure, you should be happy with your results for quite some time. And because Lumenis Active FX stimulates collagen production, you will actually continue to see improvement in your results for several months after the treatment. Q: Who makes a good candidate for Lumenis Active FX treatment? A: A good candidate is typically anyone looking to reduce the appearance of sunspots, scarring, and/or fine lines. During your consultation with one of the renowned San Diego dermatologists at Cosmetic Laser Dermatology, your doctor will examine your skin’s particular condition and recommend the treatment plan they feel will best meet your needs and give you the youthful appearance you’re looking for. At CLDerm in San Diego, our skincare specialists offer Fraxel Re:pair as an alternative for Active/Deep FX. Contact our dermatologists today to schedule a consultation, where we will develop a treatment plan ideal for your goals and desires.